The new Jaguar F-Pace SUV 4×4 Estate is a practical, handsome and luxurious proposition from an esteemed brand who are not especially known for their work in this niche. 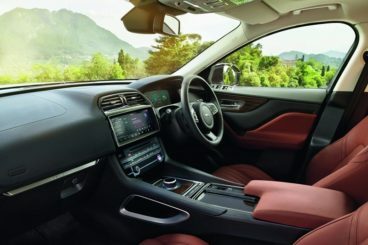 Indeed, this large family car is the first time in some 80 years of existence that Jaguar has strayed from their script of sports cars and executive saloons to launch an intriguing and exciting Estate. It arrives at a time when you’re spoiled for choice in this sector. The likes of Porsche, BMW and Mercedes are already competing for your cash, so what does the Jag have to offer? OSV takes a closer look at our Jaguar F-Pace Estate Review. This SUV Estate involves you in the driving experience 100%, and is an extremely rewarding car to drive. The precise steering fills you with confidence, while the suspension setup smooths out even the worst blemishes on some of our worst roads. If, however, you opt for the optional 22” alloys, you might find yourself shuddering and shaking as you plunder bad road surfaces. Road noise, though, is always kept to a minimum. In bends, the car resists body lean like a pro, and at times you will probably forget that you’re even behind the wheel of such a large family car. If you choose to pair your engine of choice up with the automatic ‘box, you’ll need to splash out some more cash on 4WD, but this system is better suited to the F-Pace SUV anyway. It’s a very capable off-roader. It might not be a match for the Range Rover, but it comes with electronic gadgets that will help you to keep control of the beast if you venture off-road. In terms of the engines, a 2.0-litre diesel unit isn’t bursting with power. Good for 187bhp, it will satisfy most of you though, and can get you from rest to 62mph in 8.9 seconds. It isn’t rapid, but those numbers are respectable. If you use the automatic transmission to select S mode, you will improve driver involvement. Accelerate too hard, however, and the engine will become a bit noisy. The 3.0-litre diesel will set you back a whopping £17,000 over the 2.0-litre unit, which is mated with the entry-level trim. It is a good engine, though, and can rocket you and your family from 0-62mph in a matter of 6.2 seconds. The performance is of a high standard, and the power plant doesn’t need you to work it quite as hard as the base-level variant. It’s smooth and is paired up with an 8-speed automatic transmission. There is also a petrol engine to consider, a turbocharged 3.0-litre unit that turns this car into a sports car. Really put your foot down and you’ll hear a rapturous exhaust note thundering through the car. It costs the same as the 3.0-litre diesel, but it is more expensive to run. It comes with 4WD, but this system is only used when the machine recognises that you need extra rear grip. This is a modern Jaguar, so it’s not a surprise to learn that it houses a high-quality interior. Leather trim comes as standard, and combined with the brand’s InControl Infotainment system, the interior looks contemporary and premium. The adjustable steering wheel can be tweaked up and down and in and out, while the seats are comfortable. The dash really benefits from the introduction of the new InControl Infotainment system, which is a big step up for Jaguar. It’s easy and intuitive to use, thanks to something called pinch-and-zoom functionality, and it also looks great, too. Practicality is good. Getting into the vehicle has been made fairly easy due to doors that open wide and a raised ride height, while interior space is among the best in class. If you include the optional panoramic sunroof, you might find that headroom is reduced, but at the same time, it makes the cabin feel airier. Storage is decent, with all door bins and the glovebox well-sized and shaped. The boot is impressive, and is sized at 650-litres which is a match for any car in this sector – and even some in the sector above. The rear seats are simple enough to fold, and extend the boot space to 1,740-litres. The boot is super usable, and is well shaped, while the opening is big. All models across the range are solidly-equipped. There isn’t necessarily any need to top your car up with additional, expensive options, but there are some that are useful and attractive, and which take the F-Pace up another notch. For example, the Practicality Pack comes with a hands-free boot opening, keyless entry, as well as a few other useful features. Advanced Parking Assist Park, meanwhile, makes it easier to park, while the electronic side steps (£2,076) should only be indulged if you can definitely afford it. There are also storage, lighting and personalisation options to be specified. Prices for the new car start out from around £35,000 and rise to a little over £65,000. If you’re thinking of contract hire over three years, you could pay about £320 + VAT per month for the entry-level diesel model, while the range-topping petrol model would set you back around £800 + VAT each month. Running costs are fairly good until you get to the petrol engine. Despite its hefty size, the car averages decent returns from both diesel power plants. Paired up with a manual ‘box and rear-wheel drive, the 2.0-litre diesel can achieve returns of around 57.6mpg, and will be the most popular choice with businesses. If you want to wed this diesel to an automatic transmission, you will also need to add 4WD, which bumps road tax up to £130 per year, while also changing that fuel economy number to 54.3mpg. The 3.0-litre diesel comes with the whole sha-bang, and will cost a lot more to buy and run than the 2.0-litre variant. Jaguar claim returns of 47.1mpg, while a £185 annual road tax bill isn’t actually that bad for a vehicle of this size. The turbocharged 3.0-litre petrol unit offers impressive performance, but an annual £295 road bill combined with the fuel economy of 31.7mpg might make you think twice. As usual, there is the standard three-year warranty available. You will need to take it in for servicing once per year, while the base-level variant is reasonably cheap to insure, sitting as it does in insurance group 27. The range-topping 3.0-litre petrol, however, sits high in group 42. You’ve always got an advantage when your Estate is designed by the guy responsible for dreaming up the Aston Martin DB9. 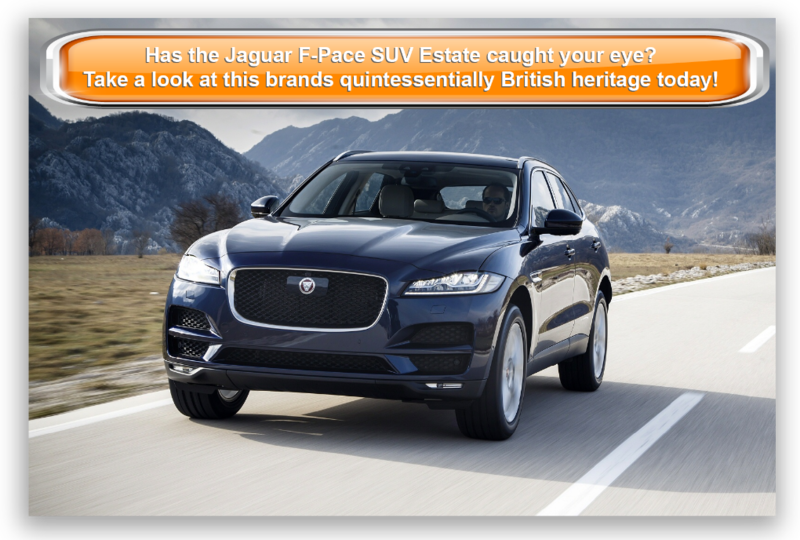 Although more and more brands are working hard to design handsome Estate’s that don’t look like sheds on wheels, few can match the F-Pace Estate when it comes to good looks. It’s a Jaguar – it’s classy. OSV has only tested the Jaguar F-Pace with automatics, but each change is so smooth that it’s barely noticeable. The Jag also finds it real easy to pick a ratio, while power is strong across the range. Even the entry-level diesel is performative enough, and is a far better bet than the one in the Mercedes GLC-Class. Jaguar have built this car with practicality clearly at the forefront of their minds. The gigantic 650-litre boot is easily accessible, and because the rear seats fold in a useful 40:20:40 split, you can load items with a length of up to 1.8 metres. Lots of you will probably want the exciting, supercharged V6 3.0-litre petrol engine that delivers 375bhp and develops 450Nm of torque, but thanks to high running costs, high purchase price, and exorbitant insurance costs, you might find yourself sadly passing it over. 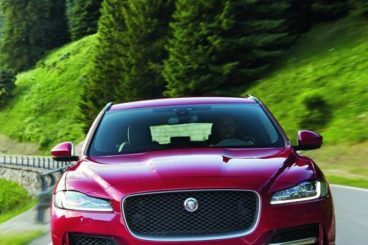 The entry-level Jaguar F-Pace isn’t too basic in the sense that it lacks luxury or a good amount of standard equipment. Rather, it only comes with the less powerful engine. If you want more power, pace and performance, you have to shell out at least an extra £15,000 over the base-level model. The F-Pace is the British brand’s first stab at a mainstream family car. If this is making you unsure, let’s see how it fares against the competition in the comparison section of our Jaguar F-Pace Estate review. 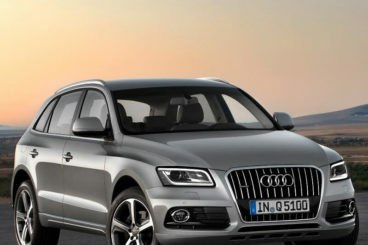 The 2016 Audi Q5 is one of the best handlers in this sector. It looks sharp, comes with a comfortable cabin, and makes for a smart all-rounder. The Q5 Estate drives very much like the saloon from which it’s derived – and this is a good thing. Body lean is well controlled through corners, while the car always feels responsive. The ride quality is, however, going to be overly stiff for some, especially in town over some of our worst surfaces. You can resolve the issue by adding smaller wheels. The steering is inconsistently weighted, and this is another issue. The diesel and petrol engines on offer are all strong, capable performers, but the base-level diesel – like its counterpart in the Jag – is a bit underwhelming. One of the best things about this car is that it will hold onto its value better than most of its rivals, including the F-Type Estate. Indeed, it’s reckoned that it will retain around half of its original value after 3 years. Running costs are not fantastic, and average returns of 50mpg from the 2.0-litre diesel are as good as things get. The solitary 2.0-litre petrol can achieve 37.2mpg. Cars like this have to be practical if they’re to shift the numbers, and although this Q5 Estate is more practical than the A4 Avant Estate, it can’t compete with the F-Type. A 540-litre boot is over 100-litres smaller than the Jaguar’s king-sized boot, although the interior is at last impressively roomy. Five adults may even be able to squeeze in at a push. 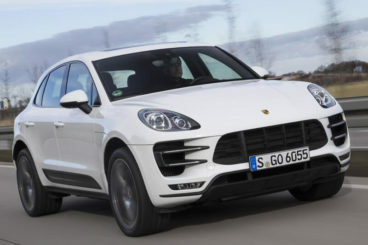 The brand new Porsche Macan is smaller than the Cayenne, but the iconic German brand hope its bigger brother will help it to pull in the sales. The Porsche Macan is the most entertaining car to drive in this class, and can offer you more fun on the road than the Jaguar. Body lean is kept a minimum, while grip is excellent. If you opt for air suspension, you will boost its speed through bends even more – provided your family can take more speed, of course. After all, the turbocharged 3.6-litre petrol engine can gun you and yours from rest to 62mph in just 4.8 seconds before maxing out at 148mph. As well as speed and performance, the car also offers lots of durability, thanks to the fact that four-wheel drive comes with all models. Take it off-road, and you’ll have no trouble at all. It is expensive to run, and will cost you more than the F-Type Estate. The diesel is the most frugal in the range, but its fuel economy can’t achieve returns higher than 46.3mpg. The Macan Turbo, moreover, might bring you lots of excitement but it will cost £285 per year in tax, and can only achieve returns of 31.7mpg. We’d argue that the Jaguar is the best-looking car in this class, but the Porsche Macan gives it a good run for its money. Slick, stylish and super contemporary, it sports a breathtaking design that should be the standard bearer for machines of this type. Inside, the cabin is quiet and spacious, and it should be robust enough to cope with the demands of family life. Despite being family friendly, it’s also quite sporty. Five people should be able to fit into the car and sit in relative comfort, with head, leg and knee room surprisingly good. The 500-litre boot, however, is disappointing and cannot compete with the space in the Jaguar. It is usable at least, while the rear seats fold totally flat to extend the space. This car is now all geared up to be the biggest-selling Jaguar ever. Quite a feat, but it’s to be expected when you consider the size of the demographic it’s aimed at. It’s expensive, but if you’re shopping around for a premium estate, you won’t find many much cheaper. Sporting classy looks, and housing bags of practicality, the Jaguar F-Pace Estate might be entirely brand new, but it’s got the makings of family car classic.